Join the discussion on our forums! Come discuss Seance over in our dedicated Seance discussion topic. “The spirits spoke to me.” "What did they say?" "You had lethal two turns ago." Zola the Gorgon without a body. Nice synergy with Princess Talanji. I'm not an avid Priest player though and will let someone else experiment with the combo potential here. this is also literal power creep. 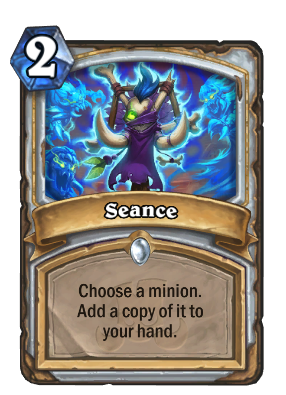 not only Seance costs in mana same, but its also common meaning that if you have bad luck at opening packs, you have 4 chances to get seance or if you craft it, it costs only 40 dusts, convert: 1/5 if bad luck, costs 100 dust to make and you can according text use it both opponent and friendly minions. I think Seance will be nerfed pretty fast when it comes. With all the OTK options that are now in the meta, 40 HP will sometimes not be enough, even if you can do it 100 times. Priest can run plenty of high value cards that you'd want to copy. The difference between 2 and 3 mana (comparing this to Zola) is huge as well. Nice synergy with Grave Horror. After Psychic Scream you can drop up to 3 Grave Horror s.
3. Then you can play Test Subject for 0 mana and do step 2. and 3. infinitely. Inkeeper : Glass of Prophet Velen? Reminds me of the seesaw effect. I'm curious to see its potential, though. Save for a few select examples (Lich King over Ironbark Protector, Stonehill Defender over Silverback Patriarch), powercreeped cards have never really been particularly outstanding (Ice Rager, Evil Heckler). I suppose that time will tell how much of an impact this has on Priest decks. Strictly better than Convert! It's about time they made this card. Pretty neat as a second and third copy of Zola the Gorgon, and it can still copy an opponent's minion like its predecessor. Princess Talanji will make this card an all-star.